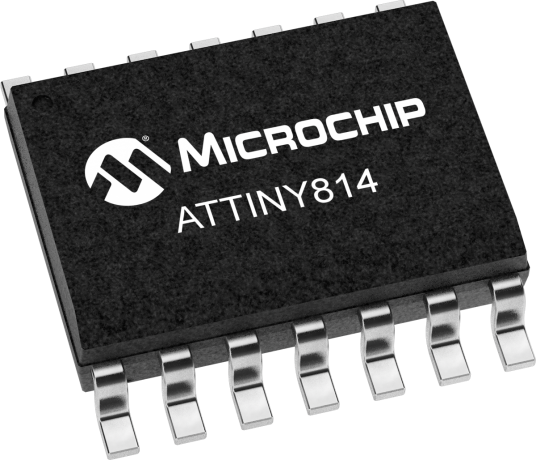 The ATtiny814 microcontroller featuring the 8-bit AVR® processor with hardware multiplier - running at up to 20MHz and with 8KB Flash, 512B SRAM and 128 bytes of EEPROM in a 14-pin package. The series uses the latest Core Independent Peripherals with low power features. Including Event System, intelligent analog and advanced peripherals. Capacitive touch interfaces with proximity sensing and driven shield are supported by the integrated QTouch® peripheral touch controller. A complete starter kit and development system for the 8-bit and 32-bit AVR microcontrollers that gives designers a quick start to develop code on the AVR, with advanced features for prototyping and testing new designs. The ATtiny817 Xplained Pro evaluation kit is a hardware platform for evaluating the latest tinyAVR® microcontrollers (ATtiny817, ATtiny816, ATtiny814, ATtiny417). The evaluation kit comes with a fully integrated debugger that provides seamless integration with Atmel Studio.